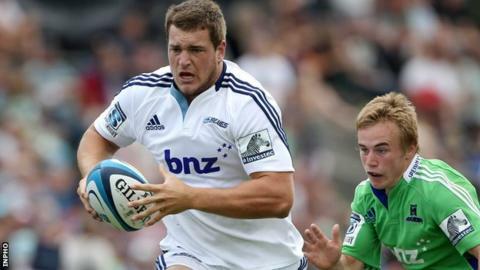 New Ulster signing Ronald Raaymakers will be unable to make his debut for several weeks due to injury. The Kiwi arrived in the province on Thursday having signed a short-term deal to provide cover for injured locks Dan Tuohy and Iain Henderson. However a dislocated shoulder means he will not be involved in the European games with Leicester and Toulon. Alan O'Connor's three-week ban leaves Franco van der Merwe, Lewis Stevenson and Neil McComb as the only fit locks. Ulster are short of second row options ahead of Saturday's European Champions Cup tie against Leicester Tigers at Welford Road, but Raaymakers, a former New Zealand Under-20 lock, is keen to get involved as soon as possible. "The first thing that went through my mind when I did the injury was that the chance to go to Ulster might be gone", he told the Ulster Rugby website. "I thought it might keep me from coming. I was pretty concerned about it but I was happy that Ulster stuck with me." Raaymakers, 24, played two Super Rugby games for Auckland and has made 50 appearances for Counties Manukau.